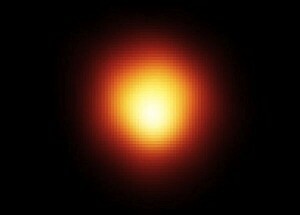 Betelgeuse is a massive red giant star located in the Orion constellation. The three stars forming Orion’s belt make it one of the most distinguishable landmarks in the night sky. Find Orion’s belt, look up and slightly to the left; you are now pondering Betelgeuse, a dying star which could go “supernova” at any time. Betelgeuse is 640 light years from our planet, in cosmic terms just around the corner. Realistically far enough away to spare Earth when the inevitable happens. A red giant is a star that has fused all its hydrogen supply, the core becomes compact and heats up enough to fuse helium into oxygen and carbon. The action of the core compacting is off set by an expansion of the outer regions which take on a red glow. Betelgeuse is huge; if you sat it on top of Earth it would cover an area all the way to Jupiter. Science has no way to determine when Betelgeuse will run out of elements. The moment iron is produced it will collapse in a millisecond, splattering the universe with the building blocks to form new worlds. The universe has a circle of life, the seasons just happen to be millions of years long.